A unique residential property will become Montreal’s first major residential rental project in more than a decade. It is part of an overall plan to revitalize District Griffin and just one in a series of projects by prominent Montreal condo developer Devimco. L’Hexagone, the $66-million 15-storey building currently under construction, is the first of three towers and will include 257 rental units, along with 28,000 square feet of commercial space. The project is being constructed by a partnership between Devimco, Fonds immobilier de solidarité FTQ and Cogir Management Corp. The complex will offer a variety of floor plans with contemporary designs. Each will feature large windows and most will have views of the Lachine Canal, Old Montreal or the downtown core. Amenities including a rooftop terrace, inner courtyard with a terrace and pool, a doorman and concierge service are anticipated to be added draws. A collaborative effort between Martin/Marcotte Beinhaker Architects, IBI DAA (IBI Group, Daniel Arbour & Associates) and Devimco Immobilier, the overall design combines MMB’s focus on architectural design and sustainable development and IBI DAA’s expertise in “community planning, land development and urban and regional development” considering both the visual aspect and connections to the broader community. 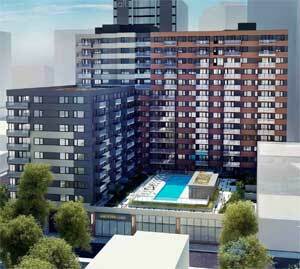 The second 15-storey tower, when constructed, will bring the total of available units to 312. Thirty of these will be “Certified Genius”- 360 sq. ft. of living space custom designed and furnished to maximize comfort and adaptability. The second tower will also bring the total commercial space available to 110,000 sq. ft. and is expected to serve both condo tenants and other neighbourhood residents. Together these towers make up phases three and four, called District Griffin sur Peel, and will have an estimated combined cost of $140 million. A third tower is also planned. Located at the corner of Wellington St. and Murray St., the complex is situated within Griffintown, the name given to a part of the city that existed from the 1820s until the 1960s and is part of a significant revitalization effort by the city. In the early 1960s the area was re-zoned light industrial and since then many of the buildings have been demolished to make way for an expressway and parking lots though remnants of some of the historic structures still remain. In 2012, the city announced plans to transform the former industrial, vacant area into a family-oriented neighbourhood which would include parks, bicycle paths and dozens of 10- to 20-storey condos. Preservation of the historical significance of some of the remaining buildings was also identified as a goal. In describing its location, the release describes a tranquil setting minutes from the downtown core and near the peaceful Lachine Canal-Peel Basin. Easy access to public transit, bike stations, major roads, neighbourhood services and night life are also highlighted. Occupancy is expected for spring 2015.